the super-human efforts nurses perform everyday! Each month, a nurse is selected by Tempe St. Luke’s Hospital nursing administration to receive The DAISY Award. At a presentation given in front of the nurse’s colleagues, physicians, patients, and visitors, the honoree will receive a certificate commending her or him for being an “Extraordinary Nurse.” The certificate reads: “In deep appreciation of all you do, who you are, and the incredibly meaningful difference you make in the lives of so many people.” The honoree will also be given a beautiful and meaningful sculpture called A Healer’s Touch, hand-carved by artists of the Shona Tribe in Africa. If you experienced extraordinary care from a nurse at Tempe St. Luke’s Hospital, we invite you to share your story and nominate him or her for the DAISY Award. To nominate someone, please fill out the online nomination form. 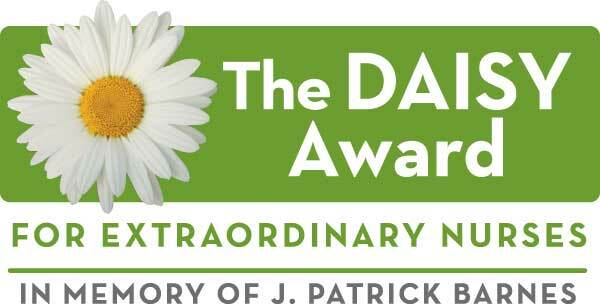 We are proud to be among the healthcare organizations participating in the DAISY Award program. Nurses are heroes everyday. It’s important that our nurses know their work is highly valued, and The DAISY Foundation provides a way for us to do that.